The mission of the Nursery Inspection Program is to prevent the introduction and spread of agricultural pests as well as protect agriculture and the consumer against economic losses resulting from the sale of inferior, defective, or pest-infested nursery stock. The Nursery Inspection Program is an integral part of the State's agricultural pest prevention system. Nursery inspection and regulatory activities have prevented numerous pests from being disseminated throughout agricultural and suburban communities by prevention and/or eradication of pests at the nursery level. The quality of nursery stock has improved as a direct result of the regulation of nursery stock. In order to sell any nursery product you must have a California License to Sell Nursery Stock. 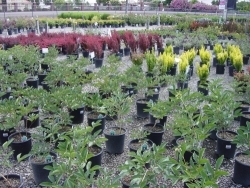 For questions, see additional information about California's License to Sell Nursery Stock. To locate licensed nurseries in your area click here. California Nursery Stock Certificate - If your nursery is found to be commercially clean, you may request a California Nursery Stock Certificate. Call our Plant Health and Pest Prevention Program at 530-527-4504, for a nursery inspection. Contact our Plant Health and Pest Prevention Program at 530-527-4504. A 48-hour advance notice is required for certification inspections. Inspection fees may apply. Persons or companies receiving nursery products from other states or from quarantined/regulated counties in California, not labeled with a California Nursery Stock Certificate or those accompanied by a quarantine hold notice, must call our office at 530-527-4504, for inspection and release. Incoming plant products must be kept in an isolated holding area away from production areas to prevent possible pest infestations. Some shipments may need to be held for several days pending lab analysis of samples taken during inspection.